Although illegal in North Carolina since 1764, when a law was enacted limiting personal winnings in any game of chance to five shillings a day, gambling continues to flourish in both legitimate and illegitimate forms. Colonial legislators and opinion makers believed that gambling undermined the value of hard work and encouraged crime. To counteract these deleterious effects, the North Carolina legislature banned public gaming tables (1791), staked card games in public taverns (1799), lotteries (1834), private gaming tables (1835), and slot machines (1939). They also forbade slaves to gamble or play any game of chance (1830). Worries about the effects of gambling on the citizenry escalated in the late 1970s, when the General Assembly discussed the possibility of legalizing horse racing and pari-mutuel betting, and again when many politicians and citizens began to lobby for a state lottery. Concerned North Carolinians and experts cited the negative effects that legalized gambling might have on the citizenry. Even before pathological gambling was recognized as a mental illness by the American Psychiatric Association in 1980, several chapters of Gambler's Anonymous and GamAnon, support groups for pathological gamblers and their families, were founded in North Carolina. By the early 2000s, North Carolina's gambling laws remained among the least permissive in the nation. The legislature finally approved a state lottery in 2005 after much political debate about the merits and evils of the institution. Except for the casino run by the Eastern Band of Cherokee Indians in the western mountains, bingo and licensed raffles were the only games of chance permitted by North Carolina law. As a result, North Carolinians continued to flock to Virginia, Georgia, and South Carolina to place their bets on horses and video poker. Within the state, illegal sports gambling, video poker, off-track betting, and other forms of wagering also continued despite the efforts of law enforcement authorities to stop them. 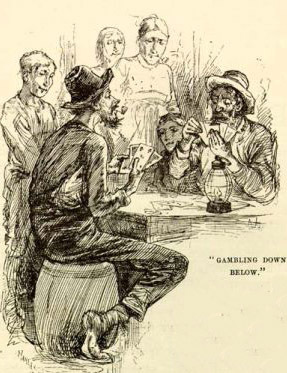 Search results for 'Gambling' in the North Carolina Department of Cultural Resources Digital Collections, including several laws related to gambling in North Carolina. Act to prevent free persons from gambling with slaves: Laws of the State of North Carolina, passed by the General Assembly [1838-1839]; North Carolina Department of Cultural Resources Digital Collections. Mark Twain, 1835-1910 Life on the Mississippi. Boston: James R. Osgood and Company, 1883. Image courtesy of DocSouth, UNC Libraries. Available from http://docsouth.unc.edu/southlit/twainlife/ill70.html (accessed July 20, 2012). 1 January 2006 | Homrighaus, Ruth E.